Fairly modern SUVs like the Hyundai Santa Fe ride better, handle better and sip less fuel than dual-range, offroad-capable SUVs like the Ford Everest. Yes, vehicles such as the Everest have higher towing capacity and are better offroad, but what if you don’t tow a big van or go offroad? 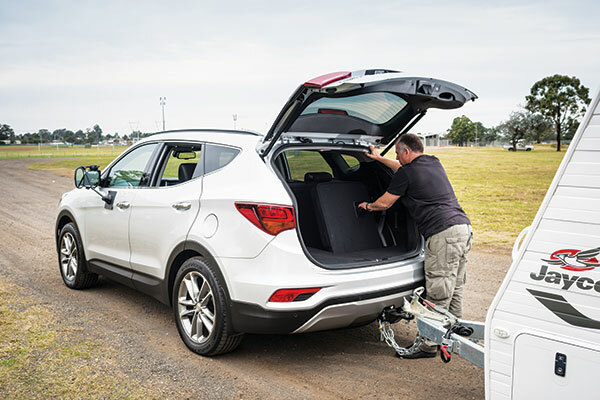 With its 2000kg/150kg towing maximums, the Santa Fe can tow many new single-axle vans, some new European tandem vans and plenty of older tandem vans (usually those without a shower toilet). So is the Santa Fe a realistic medium-sized tow tug? That’s what we aim to find out. 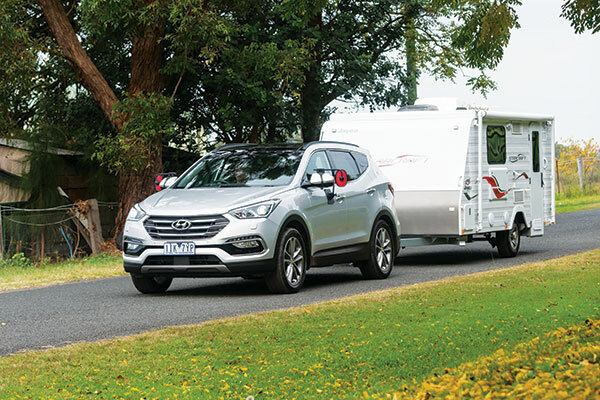 The Santa Fe’s cabin is comfortable and spacious and is a testament to how far the brand has come – material quality and fit and finish are very good. It’s interesting to compare it with the similarly-priced Discovery Sport we tested last month – the Land Rover has a more luxurious presentation, but its standard equipment is relatively sparse. Once you option the Disco Sport up to the same level as the Hyundai, it is much more expensive. Only the Santa Fe’s third row seating is tight on room, and the small side windows back there don’t give occupants much of a view out. The cargo area space has a 560L capacity with third-row seats folded (1616L with both second- and third-row seats down). It has enough room to pile in holiday gear and is easy to access with a relatively low loading lip. 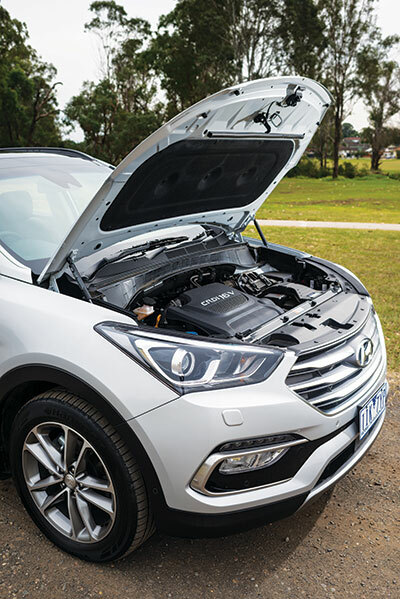 The Santa Fe’s 2.2L turbodiesel has been around since 2010 and while, it delivers ample power and torque, it isn’t as smooth and quiet as more recent diesels. Yet it revs willingly to its redline and turbo lag at low rpm is minimal. Its mid-range response is excellent. Where the 2.2L diesel also excels is in its fuel-sipping ways. With mostly highway cruising and a bit of urban running around thrown in, the Santa Fe averaged 7.2L/100km. With a 1168kg caravan hitched up, and including a mix of freeway and stop-start driving for photography, diesel consumption rose to 13L/100km. The Santa Fe has standard, economy and sport modes, but for most driving (including towing) it works well in standard mode. The six-speed auto has a well-matched spread of ratios, and is smooth with its gear changes too. You’re not getting the most agile or dynamic SUV there is with the Santa Fe, but the local suspension tuning (which Hyundai does with all its vehicles sold here) has paid off. Ride is firm but supple enough and it remains well-controlled over some of the typical rough roads we have in Oz. The new electronic driver assistance bundle works seamlessly. The active cruise control, for example, doesn’t leave braking until the last second (as some other ACC-equipped vehicles do) if traffic slows – it’s nice and progressive. There are a few towing recommendations when you delve into the Santa Fe’s owner’s manual: Hyundai recommends that you don’t tow for the first 2000km of the vehicle’s life to allow everything to bed in and that you shouldn’t go faster than 100km/h (or 70km/h up steep hills). Hyundai also advises against using a weight distribution hitch (WDH). Provided that your van is well balanced, and with a relatively low ball load, a WDH should be unnecessary anyway. The standard towball download is restricted to 100kg unless the Hyundai Genuine Load Assist Kit is fitted, which then increases the TBM maximum to 150kg. Still not ideal if you want to run 10 per cent at the maximum allowed towing weight, but much better than the five per cent without the kit. The van we towed weighed 1168kg and had 102kg on the towball, so it was pretty light. The only other choice available was close to 2000kg Tare, but that would not have allowed for theoretical payload and, thus, would not be representative of what the Santa Fe can tow. The Jayco was a full-size van, though, and its Tare weight wasn’t exactly that of a box trailer. 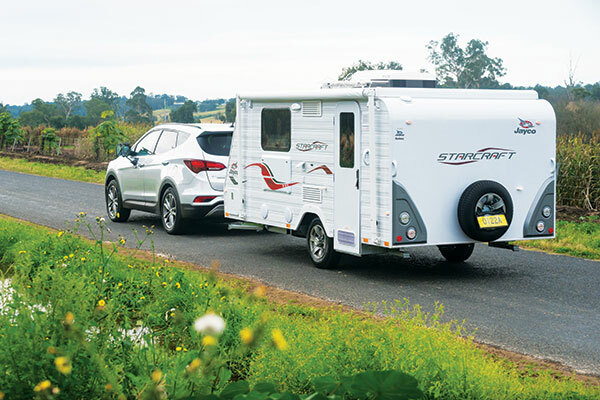 Backing up to the caravan coupling was easy with the Santa Fe’s rear-view camera, which gave a good, wide-angle vision, including the towball. 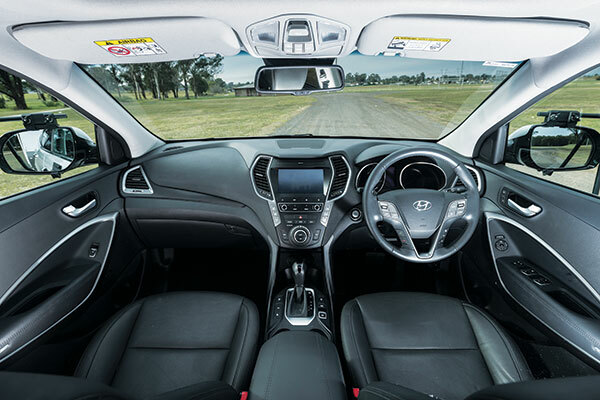 Our towing mirrors (which attach to the Santa Fe’s mirrors) clipped on to the Hyundai’s mirror shells easily, and were secure for the duration of the test. The rear of the Santa Fe barely dipped with the weight of the van dropped on its towball, no great surprise given the light ball load. On the move, the Santa Fe towed the van well, with quite strong hill climbing and overtaking ability. The Santa Fe was also very stable, with no swaying and very little pitching. 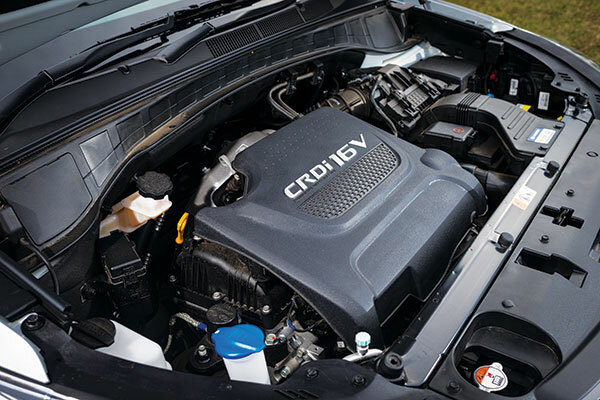 Engine braking is quite poor, the Santa Fe’s relatively low-compression (for a diesel) and free-revving nature working against it for when you need engine braking. 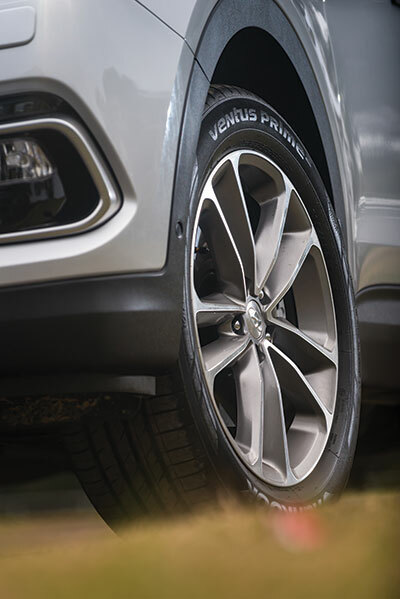 The Santa Fe Series II is still a competitive player in the medium-capacity SUV tow-vehicle market, with its new features and driver-assist technology keeping it fresh. Its towing performance is very good, with good fuel economy and touring range with it. 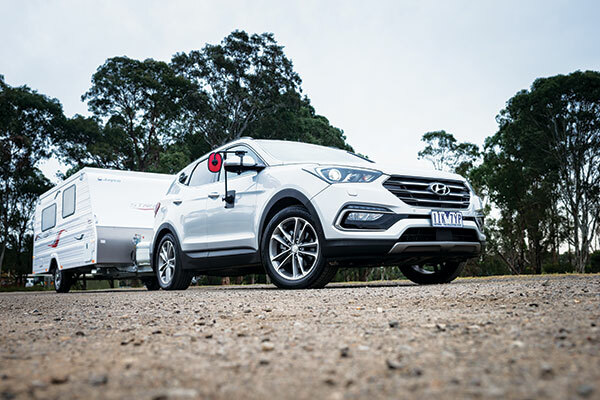 The only thing that could really improve the Santa Fe is how much it can tow: another 500kg in towing capacity would broaden the options considerably. Thanks to Jayco Sydney 63-67 Glossop Street, St Marys NSW 2760 (ph 02 9623 1971) for the loan of the caravan for this test. The full tow test appears in Caravan World #566. Subscribe today for the latest caravan reviews and news every month!